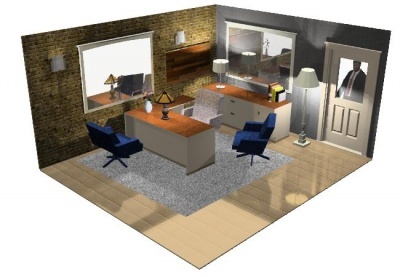 This is a sample image saved from SketchUp demonstrating shading, transparency, materials, etc. This is the same model run through the IRender renderer demonstrating lights, multiple shadows, reflection, Antialiasing, and soft shadows. Photorealistic refers to creating images which resemble a photograph. Use of textures and materials. Shading (brightness of color) based on angle to the lights. Point light sources and spot lights. Reflection on surfaces - direct reflection such as mirrors, or reflection from shiny surfaces. Indirect Lighting - which incorporates the effects of light bouncing off of other surfaces creating softer, more natural shadows. To Create High Resolution images from SketchUp, use a rendering engine such as IRender nXt and choose the resolution desired. See SketchUp High Resolution Images .